HN Issue 14: What's On Your Plate? Global Meals! 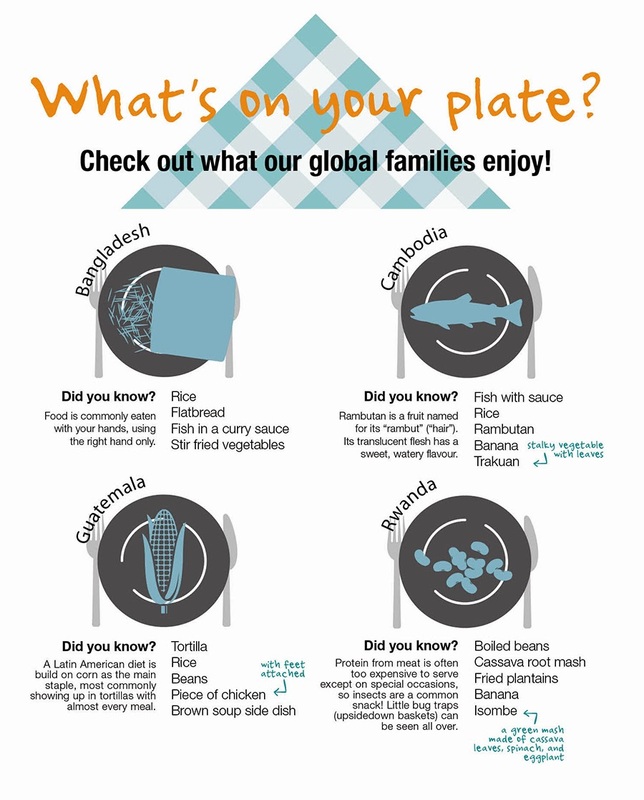 Have you ever thought about what a "normal meal" looks like for families worldwide? Not only do we celebrate different holidays - not everyone enjoys Thanksgiving dinners, much less eats turkey! - but our staple foods can be very different. Yet, each meal embodies the richness of each of our respective cultures! Food for the Hungry Canada is actively partnering in each of these displayed countries. Families there helped us see what their day-to-day lives are like. And that included what they eat! So next time you sit down to your plate of chicken and potatoes, or pasta and salad, think how else it could look if you were born elsewhere! Bon appetit! This infographic was featured in the Food for the Hungry HOPE NOTES Fall/Winter 2013 Issue. To enjoy the full infographic, which includes statistics about the "day-to-day" of families all over the world, click here. Food for the Hungry: HN Issue 14: What's On Your Plate? Global Meals!